Coming Sunday: Detroit 911: A documentary on Detroit emergency response times. 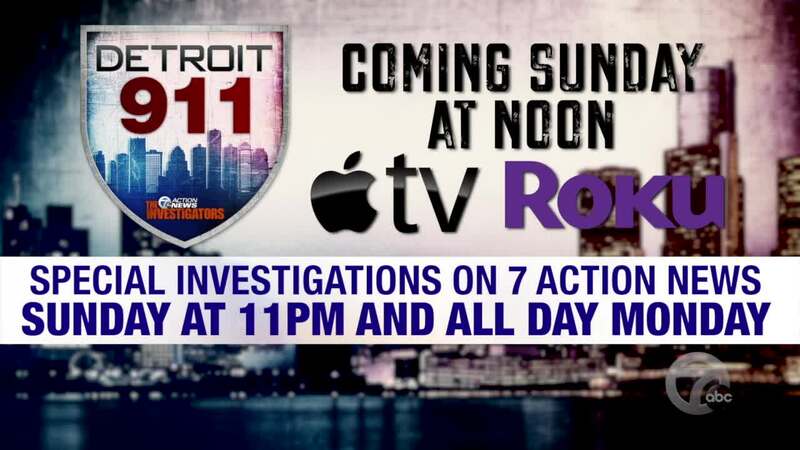 (WXYZ) — On Sunday at noon, we will release a 7 Investigators documentary titled "Detroit 911." The documentary follows a months-long investigation into emergency response times in the city of Detroit. Hundreds of Detroit 911 calls are taking hours for police to respond despite officials touting otherwise. The documentary will release on Roku, AppleTV and Amazon Fire TV. We're asking you to add our app on one of those, if you have them, to watch the documentary on Sunday. It will also air in four different parts during 7 Action News on Sunday at 11 p.m. after the Oscars and throughout the day on Monday. To download our app on Roku, click here or search "WXYZ" on your Roku. For AppleTV, search "WXYZ" in the app store on AppleTV or click here . Finally, on Amazon Fire TV, search "WXYZ" or click here . If you don't own any of those platforms, the documentary will be shown on our Facebook page and online beginning Monday night.